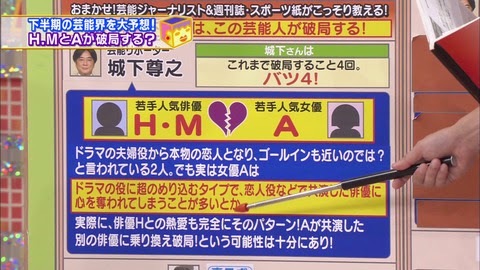 Blind items, or as they call it 'initials talk', on TBS program 'Akko ni Omakase!' which aired on 31st August. The items came from people who have worked for years in the entertainment industry and gossip magazine journalists. Romance. Young singer and actor M and young actress I.M with strong acting ability. They grew close quickly after acting as lovers in a drama about 10 years ago. In the drama, they started out on very bad terms but are gradually drawn together. In real life though, they hit it off as soon as they met. Their romance, built up from secret dates, has gone on for about 10 years. After all this time together, there is a possibility that the relationship and marriage will be announced at the same time. If you hear their names, you will be surprised at this big couple. Romance. Multi-talented R.F and singer/actress with strong acting ability S.K. They met when they co-starred in a movie. S likes creative types with individual style and is charmed completely by the much older R. Actually they have been spotted hugging and kissing at Azabujuban. Romance. Variety talent Y.M and former model U.K. Currently on hiatus, Y is thinking of returning to showbiz soon. Before that, she will marry U and make the marriage a talking point in variety programs. She has nothing to lose anymore. By the end of the year, she will be married and hold a press conference with him, marking her comeback. Breakup. Young, popular actor H.M and young, popular actress A. From playing husband and wife in a drama, they became real-life lovers and were thought to be heading for marriage soon. In reality, A is the type that gets immersed in her roles and often falls for co-stars playing her lover. There is a high possibility that it will happen again with another co-star. Breakup. Popular entertainer H and variety talent A. They're a couple with a big age gap but get along well. But Tokyo Sports reported that H went on a goukon behind A's back. Divorce. Singer A and actress K.
Married actress K has recently made a full-scale return to the entertainment industry after giving birth. This is to make up for loss earnings by her husband A, after he left his agency. Her husband set up a fan club and his own label but they are not going well. The day that she's giving up on him is near. Divorce. Superstar singer M is heading towards her third divorce. The countdown to superstar singer M's divorce has already started. Actually, she has a deep relationship with her manager and her feelings towards her non-celebrity husband has cooled. They might get divorced before the end of the year. That Actor and Singer M and actress M.I. I wouldn't be surprised at all if they announced the relationship and marriage. Been anticipating that for a long time now. It's just a matter of timing for the announcement. M and I.M = Matsumoto (Jun) and Inoue Mao. Y.M and U.K = Yaguchi Mari and Umeda Kenzo. Divorce: Superstar singer M is heading towards her third divorce. M? a veteran one? 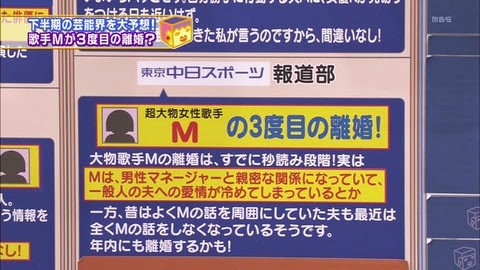 M is most likely Matsuda Seiko, she's the only one I can think about that has married three times (third is a teacher).